Nearly sixty of Foxboro’s seniors crammed the tight quarters of the town hall meeting room last Tuesday for the Advisory Board meeting on the town budget. Several budgets, including the Foxboro’s Council on Aging were reviewed. With all due respect to this board, their decision is obviously a difficult one. Budget cuts must be made, but the Council on Aging is an essential town service and cuts must be made elsewhere. The possibility of the Council on Aging’s budget being cut in any way is appalling, much like other towns slicing police and fire fighting budgets. The Council on Aging is a VERY essential service. Asking them for any kind of budget cut is a great slap in the face to an organization that is critical to Foxboro, yet is composed only of two caring people and many volunteers who perform miracles with a tiny budget. Foxboro’s over-sixty population, at 2654, is vital and growing rapidly (indeed, the elderly population in this state is exploding). The backbone of our community, our seniors aren’t ancient, useless people, but folks over 60 who are out and about, enjoying life and helping the community. They’ve fought the wars, raised the families and worked hard all their lives. Many seniors now enjoy life in their own home well into their nineties. Activities: Unbelievably, after all these services, Council on Aging still manages to provide a multitude of senior activities such as CPR classes, help with tax preparation, dancing, computer classes, Christmas fairs, picnics, exercising, swimming classes, bingo, painting, videos, lunches around town, bridge, pinochle, crafts, cribbage as well as taking the seniors on many fun trips, such as Boston, boat tours, movies, plays, the Aquarium, baseball games, and many, many more. This impressive list isn’t even half of the services Council on Aging provides — just open the weekly “Seniors” page in the Reporter — there are often two full pages of activities, services and events for seniors, all courtesy of Council on Aging. These services help keep our seniors involved, help them maintain a connection with each other and the town, and makes their lives easier. Cut their budget? Who will decide which of the above important services should be cut? Council on Aging regularly provides services to over 850 of Foxboro’s seniors, and also helps hundreds more. With a small budget of about $69,000 they stretch every dollar to best benefit Foxboro seniors. With the exception of the director and a part time secretary, Carol Haddad, Council on Aging has no staff, and relies on volunteers for assistance with day-to-day operations (the only other two employees are van drivers who do not work in the office). Much of the Council on Aging office furniture and equipment was donated or salvaged. Council on Aging applies for many grants, but most received aren’t very large. They rely heavily on the generosity of organizations like the Jaycees and other groups and individuals. Even the Council on Aging’s vehicle, the “Van-Go,” the lifeline of the seniors, was purchased with their fund-raiser money and not donated, like in other towns. A good portion of the increase in the Council on Aging budget is for the director’s salary, which is the first increase for that position since the 1970s, and is only intended to bring it into the 1990s range. The director has no office to speak of, must double as the building’s custodian (including cleaning bathrooms) and with her assistant single-handedly runs the office in what is obviously a burn-out job. The director’s proposed salary increase would still not take into account the many, many extra hours she puts in every week to keep Council on Aging running — Lorraine only clocks 50 hours a week but works many evenings and week-ends and is constantly on call. Council on Aging is also asking for a small increase in the office supply budget from $120 to $600. Note that the amount is the ANNUAL office supply budget. Previously, the office supply situation was so bad that they had to rely on people to bring in boxes of pens and pencils, and the kindness of folks who donated paper and copier toner. As everyone in town should know by now, there are plans in place to build the much needed Council on Aging/Human Services building on Central Street at the Carpenter school site, and there will be a series of fund-raisers to benefit this very worthy cause. One of the first fund-raisers will be a dinner dance at Demetries on March 30. (Tickets are only $15 and are on sale now at Lovely Insurance Agency, Town Hall, Cindi’s Jewelry, Council on Aging and Foxboro Human Services). At the end of the Advisory Board meeting, the floor was opened to questions. One senior raised her hand and stood up and said with a smile, “Just remember: We Vote!” Another senior added, “…and we pay taxes, too!” Dismiss that notion of the ancient senior in a wheelchair with nothing to offer the world anymore. 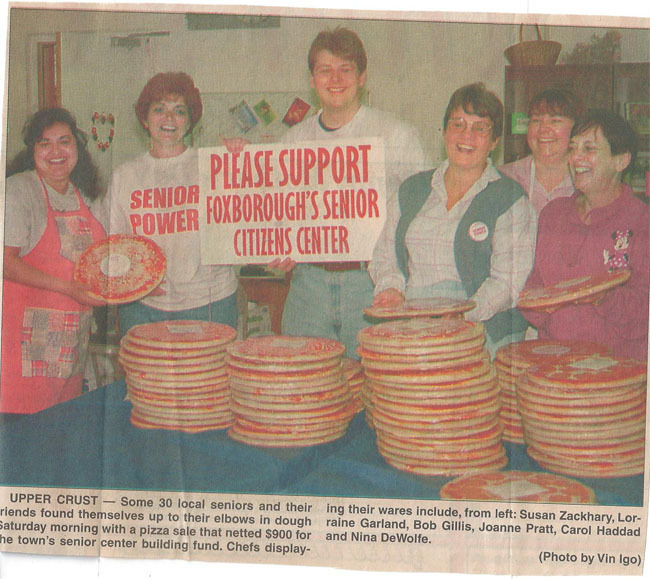 Foxboro’s seniors are a lively, important group, and they WILL be heard. Supporting our seniors is not only an investment in our past and present, but also in our own future. If the Council on Aging budget is cut, it’s like mortgaging our own future, and it sends a clear message to the public that seniors don’t matter. Is that really the message we want to send our seniors? Of course not. Lorraine and Carol take care of the seniors in countless ways, providing a myriad of services and activities. They are the senior’s lifeline. I don’t think we’re asking very much that they be compensated fairly for the valuable service they perform for our seniors. Quite frankly, we should be INCREASING Council on Aging’s budget. We should be giving them all the support and help they need. The Council on Aging is one of the nicest parts about Foxboro and is as essential to the town as police protection and fire fighters. Let’s give the Council on Aging the recognition and respect it deserves, and cut the budget elsewhere. [Updated] Foxboro double power outage: Forgotten already?